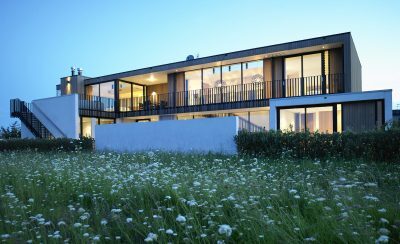 This family home is a contemporary country house and is located in grassy fields at the edge of a steep gully. The house and the landscape are designed as an integral whole, interacting with the surrounding landscape not in a deferential way but by framing it and by contrasting it. 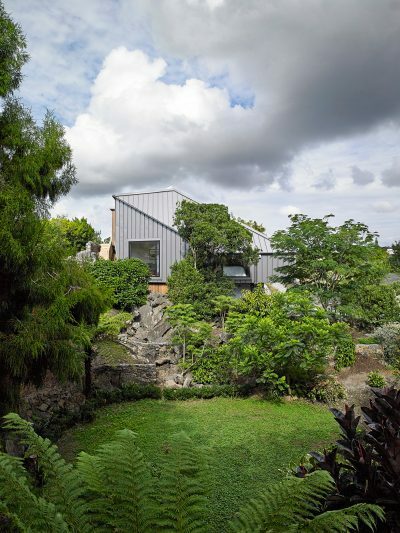 The house stretches out into the landscape and the landscape is drawn into the architectural space. Formally the house is an abstract composition of horizontal and vertical planes differentiated by contrasting surface textures. It has an axial plan bisected by elongated rectilinear forms, lending a sense of clarity to a complex programme. 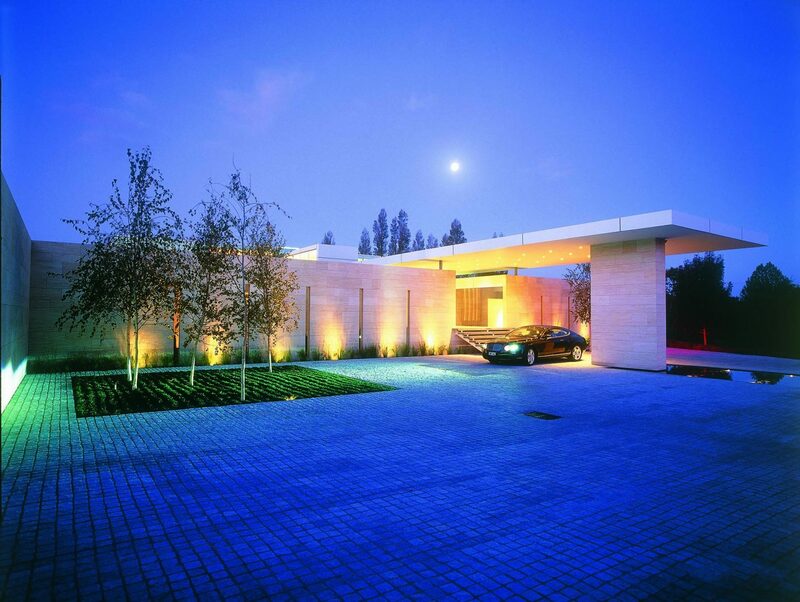 Stone walls define a series of outdoor spaces, some for cars, some densely planted with trees and some paved for outdoor living. The living areas pivot around the central dining hall, with changes in floor level defining the individual spaces, and open out to terraces at the edge of the gully. The bedrooms are located in an elongated box that hovers above, offering dramatic views into the gully. The garage, recreation room, cinema, study, wine cellar and gymnasium are located in the lower stone block and separated from the living spaces by a bridge over a densely planted garden. Materials have been tailored in a seamless way to emphasise the planar forms and to allow the qualities of each to be heightened. 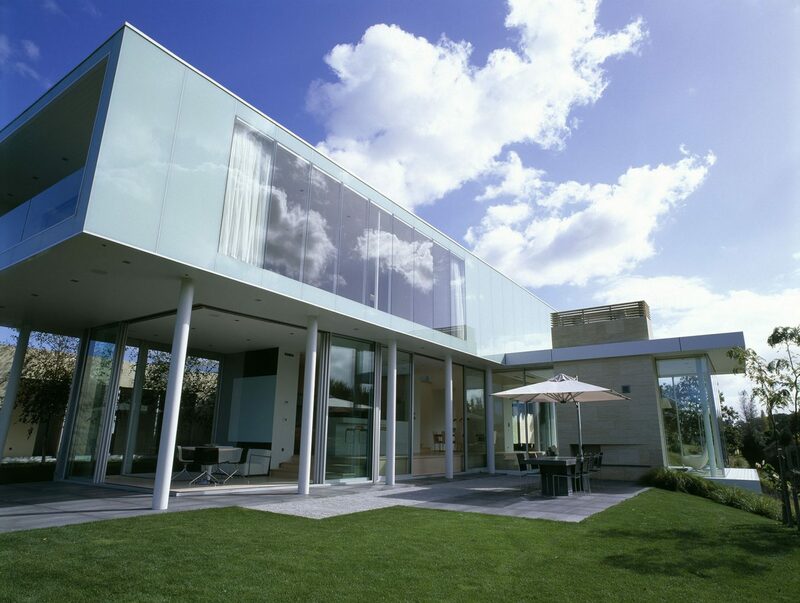 The sleek surface of the glass cladding of the upper floor dematerialises in the reflections of trees and clouds, the tightly fitted stone accentuates its grainy texture, the white oiled ash floors have a silky feel and the porphory pavers have the texture of rough linen. The journey through the house is marked by a series of engaging moments. The visitor drives through park land into the motor court and under the entry canopy, ascends the front stairs, passes over a lap pool, through a gallery space, over a bridge within a forest, slips through a gap in a stone wall, into a double height dining hall and arrives in a glass cube hanging over a precipice.